Doing what is right when it’s easy, is, well, EASY. Doing what is right when it’s difficult takes courage and practice. Many times we don’t see the fruit of our good, God honoring decisions until eternity. We live in a world where instant gratification is glorified. We tend to pamper ourselves and push away anything that may hurt us or that takes work. We must raise up the next generation to see the great harvest of obedience. We must reinforce this truth in the everyday acts. I remember when I was a little girl, I was a big football fan. I really wanted my favorite team’s jacket, and saw one in the store. It was one that wasn’t my favorite, but I was impatient and chose to buy it anyways. The very next day, the one I really wanted went on sale. I had buyers remorse because I chose to be impatient and settle. This may seem like a silly example, but it still sticks out in my mind until this day. Part of obedience is staying the course and remaining faithful. This takes patience and faith. Our children may have to learn these hard life lessons in order for God’s truth to practically sink in. It’s hard to watch our children fail and struggle, but sometimes it is for the greater good and will be the tool that will help them make the right choices as they approach their teenage years and adulthood. Stewardship: To clean their room- because it’s important to be good stewards of their things (even when they’d rather go outside and play with their friends). Kindness: To treat their brothers and sisters with kindness- because the Bible says to be kind one to another (even when we want to be angry and fight and act out in the flesh). Honesty: Not cheating on a test- because God says they need to follow the rules and authority He has set over them (even when they might be tempted and would love to get a good grade). Contentment: Don’t steal- because it’s wrong to take something that is not theirs and covet what their neighbor has (even when they really want something tangible right now). 1) Let them make mistakes. Keep a careful watch over your children and ask the Lord for wisdom. In a particular situation where you might want to save them from failure, would this be a good time to let them learn hard lesson? 2) Admit when you are wrong in front of them. This is by far, the most humbling thing I have to do as a parent. When I do something wrong, It is so valuable for my children to see me stop, admit it, and then ask for forgiveness. So so important! 3) Teach them to be selfless with material things. One of the biggest problems with the flesh and being human is out attachment to our material things. Money. Remind your children that to be truly rich in this world is having a servant’s heart; one that is giving and willing to sacrifice for others. 4) Praise them when they do something right. It’s easy to correct and point out when our children are doing something wrong. We get into a habit of it because, many days, this may seem like all we do. Just like our children, we get sick of hearing about our shortcomings, don’t we? Are you more likely to change with some gentle encouragement and praise, verses yelling and harshness. Our kids respond to our joyful praise of their right behavior. Spread it on thick and be watchful of creative ways to praise them. 5) Teach them the importance of keeping good company. This was one thing my parents always taught me and stressed. We become who we hang out with. Without even thinking of it, we start to mimic the mannerisms, sayings, and behavior of the people we hang out with on a regular basis. 6) In everything they do, they should be seeking to glorify God. Before your children make a decision, ask them this question: Will this glorify God? Is this just the easy way out, or would a different decision glorify God better? 7.) It’s not all about them. This world is too concerned with damaging our children’s egos; but in reality, our children’s egos need to be crushed before the alter of God. They need to learn to lay down their wants and desires at the foot of the cross and ask Christ to have His way in their life. To do this, we must learn and embrace the truth of God’s Sovereignty. That He really does know best for all of our lives, and we do not. 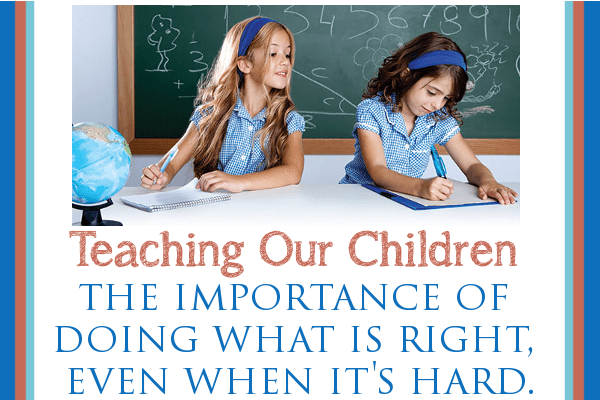 How do you teach your children the importance of doing what is right, even when it’s hard? This entry was posted in Blog and tagged Children, doing the right thing, Making Wise Decisions, Obedience, Parenting by Traci Little. Bookmark the permalink.